...And His Current Sick Abuses! ...And His Victims' Plans to Widely Reveal All! Allebach Communications Creative Director and former long-time illegal drug addict Bill Villa and his wife Arcangel run a malicious, misogynistic, and racist hate blog smearing and threatening nearly 60 innocent people -- including law enforcement officers, a District Attorney and Assistant District Attorney, teachers, academics, journalists, lawyers, business professionals, civic leaders, civil rights leaders, and clergy members (see our BillVillasVictimsUnited.com homepage). He does this because he delusionally believes they are arrayed in a vast conspiracy against him. In a criminal complaint against Villa, the arresting officer noted that Villa did not know "his own name and address or where he was." Unfortunately for his victims, Bill Villa's grip on reality has not improved significantly since then -- but his ability to smear and threaten certainly has. Seriously, take a look at the blog and ask yourself what kind of mentally and emotionally damaged person does something like that to so many fine people. Then ask yourself when he's going to hurt someone. 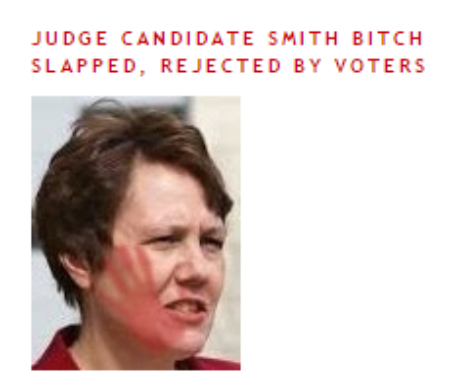 In one of many atrocious "features" on their hate blog "Lehigh Valley Somebody", the hate blogging Villas created this disgusting photo fantasy of a distinguished and highly respected female Assistant District Attorney having been physically assaulted and injured (note the superimposed lived red handprint on her face). Then Bill Villa added misogynistic insult to injury, "joking" that she had been "b*tch slapped." And there are myriad abuses just like this one against nearly 60 innocent people at Villa's hate blog "Lehigh Valley Somebody." Anyone who interacts with Bill Villa has every right to know the potential risk they and their families face (he is especially apt to "punish" his victims by menacing their female family members) of joining the nearly 60 innocent people threatened and smeared on his “Foes List.” Indeed, it is grossly unfair, irresponsible, and disrespectful to in any way knowingly expose anyone to that danger without the decency of a sufficient warning. Would you want the prospect of Bill Villa endangering the reputations and peace of mind of your employees and their families without having had fair warning? Would you want your distributors and customers to know that you were doing business with the "man" who produced the disgusting depiction of violence against women shown above? As just one of what will be many examples, we'd bet that the unfortunate fellow who is the distinguished advertising industry veteran serving as Allebach Communications' Account Director and Media Strategist is not looking forward to the terribly unfair burden of having to explain to his clients at, for example, Entenmann's why Allebach Communications hired and continues to employ Bill Villa -- the vicious hate blogger victimizing nearly 60 innocent people -- without giving them fair warning of the risk they face. Other Allebach Communications representatives should have similar concerns for clients upon which Villa is inflicted such as Good Health Snacks, Salada and Red Rose Tea brands, Grainful, etc. We're sure the Management Team at Entenmanns's has far more integrity and respect for their customers than to knowingly promote their products with campaigns crafted by Allebach Communications' Creative Director Bill Villa -- the Joseph Goebbels of mendacious, racist, misogynistic, and menacing hate blogging in The Northeast. We can't imagine they or their distributors and customers would tolerate someone in their business who has demeaned women in the disgusting way Bill Villa has. And we believe this is likely true of most national brands throughout the food and beverage industry. Here at Bill Villa's Victims United, our mission is to use our collective experience of years under attack to help Management Teams like Entenmann's keep their employees and their families safe from the reputation vandalism and menacing references to violence suffered by the nearly 60 innocent victims of hate blogger Bill Villa's “Foes List.” And we'll be here for all the other Management Teams whose employees are potential victims of hate blogger Bill Villa. ... an audience he does not want. It's up to you, Bill. We're here to help if you let us. Until then, we'll be helping those who associate with you stay safe from your online lies, threats, and abuse to which you have subjected so very many fine, innocent people. Concern is growing. You won't be the first to have reached out to us. If you want to help spread the word and "build the Bill Villa brand", we've developed "self service" tools to empower Bill Villa's victims and their loved ones to make their voices heard. They're here, and many more are on the way!